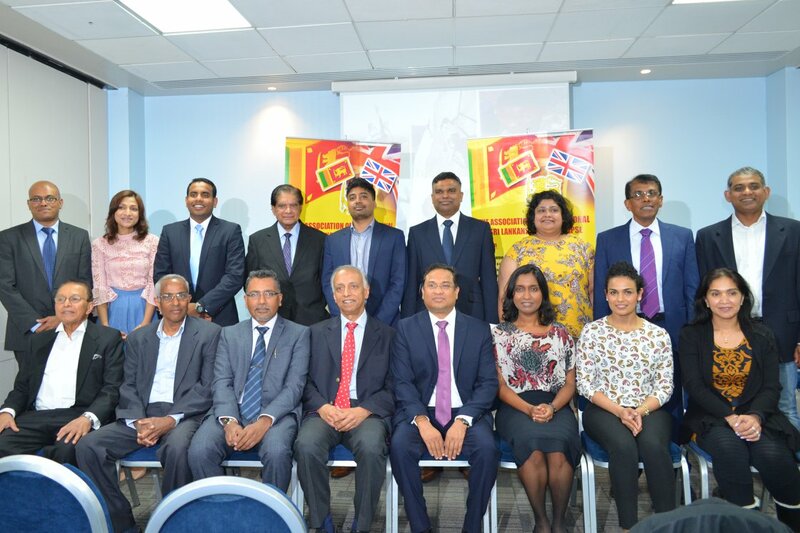 The 14th Annual General Meeting (AGM) of the Association of Professional Sri Lankans in the UK (APSL), was held on Saturday 12th May 2018 at Citadines Holborn – Covent Garden, London. Mr. V. Vincendrarajan, Third Secretary (Political, Commonwealth and Media) at the Sri Lankan High Commission attended the meeting representing the acting Sri Lanka High Commissioner, His Excellency Mr. Sugeeshwara Gunaratne, who is the Patron of the Association. The first session of the meeting began with the welcome address by the President Mr. Suraj Wijendra. He briefly outlined the progress made during the period of 2017-2018 and thanked the executive committee, all members and well-wishers who supported the association during the year. During the speech, he highlighted the importance of APSL working together with like-minded organizations on various humanitarian projects. Also, he mentioned the excellent progress made by APSL projects including scholarship scheme, cancer relief fund, solar village project and the impact of those projects. Mr Suraj Wijendra’s address was followed by the reading of minutes of last AGM by the General Secretary, Dr Mohan Siriwardena. After the adoption of the minutes, Dr. Mohan Siriwardena presented the Annual Report for the year 2017 – 2018. Three executive committee meetings were held during the year 2017 – 2018. These meetings were well attended by the executive committee members and number of conference calls were held during the period. Various policy and planning matters related to proposed projects and events, were discussed and agreed during these meetings. At the AGM, it was noted that the year 2017-2018 was another highly successful year with serval projects achieving significant milestones. The fundraising Dinner Dance event to celebrate the 13th anniversary of the Association of Professional Sri Lankans in the UK (APSL UK) was held on 23rd Sept 2017 in London, with the presence of a large gathering of members, their families and well-wishers of the Association. This year the event was dedicated to raise funds for the newly launched APSL Cancer Relief Fund. The APSL Scholarship Scheme launched in 2014, to provide financial assistance to gifted but underprivileged school children in Sri Lanka, continued to grow during the year too, under the leadership of Mr Mervyn Silva. The total number of scholarships now stands at 58, which is an increase of 24 from the last year. A fundraising dinner dance was held on the 24th March 2018 in Manchester. This event was well attended by current sponsors as well as friends and well-wishers. Several new donors signed up to offer scholarships to needy children. APSL is actively seeking donors to sign-up to help expand the scheme. Infrastructure – Applications from hospitals and treatment centres with a genuine need to invest in patient facilities. APSL commissioned a APSL Solar Powered Village Development project in Nochchiya, in Kurunegala District, Sri Lanka. A 6.0 kW solar roof was installed in January 2017 in Nochchiya village cluster and connected to the National Grid (NG) under “Net Plus” scheme. This project was delivered in collaboration with Hela Sarana, another UK registered charity. APSL Solar Village Project Team under the leadership of Prof. I M Dharmadasa is currently monitoring the technical performance and the wider socio-economic impact of this project. Feedback received from the village development council so far is extremely positive, and the publicity provided for this project has now attracted significant attention from policymakers in Sri Lanka. For the first 12 months from Nochchiya solar roof, the average units produced per month is ~520 kWh and the total produced during the first year is 6240 kWh. Therefore, the total income from the solar roof per annum is Rs. 137,280.00 (per month is Rs. 11,440.00). The system provides clean water to over 1200 people and seven surrounding villages can buy clean drinking water for nominal fees to avoid kidney disease. As a help to the community, motivation certificates with education packs were distributed once, and 2 APSL scholarships were awarded from January 2018. Building on the success of the previously held discussion series conducted at various locations in the UK including London, Birmingham and Manchester, a ‘Living in the UK’ event was held at the Redbridge Buddhist Vihara in Ilford on the 28th January 2018. This was held with patronage of the Her excellency the Sri Lankan High Commissioner Ms. Amari Wijewardena and Ven. Hemarathana of the temple. The event was a discussion centred on Eastern and Western values and the day to day experiences Sri Lankans face living in the UK. Dr. Dulini Fernando and Mr Rohan conducted an interesting interactive discussion with the children. Feedback was excellent and APSL is planning to conduct similar events in the coming year. When several districts in Sri Lanka were affected by severe floods during the month of May 2017, APSL responded in numerous ways. Firstly, APSL responded to an appeal from the Sri Lankan High Commission and donated 5 packs of Tarpaulins (10 in each pack). Secondly, APSL responded to an appeal from the Education Director of Ratnapura District, to help the school children affected by the floods. APSL in collaboration with London Buddhist Vihara successfully completed a joint flood relief programme to help children affected within the district. Accordingly, 200 school packs were distributed to the children at Rathnodaya Maha Vidyalaya, Hangamuwa, Nivitigala in Ratnapura district on 06th August 2017. Teachers and parents of the children participated in this event. APSL Membership Secretary Mrs Gayani Senaratne, coordinated the distribution of relief items by liaising with the Education Department authorities in the Ratnapura. We wish to thank and offer our sincere gratitude to Venerable B. Seelawimala, Head Monk of London Buddhist Vihara, the management committee, and the supporters of the London Buddhist Vihara for collaborating with APSL to implement this programme. This is one of the three (3) new projects launched during the year 2017-18. The project aims to provide mentoring support to APSL members and non-members, based in UK and in Sri Lanka, to develop their professional careers. APSL is actively looking for mentors from now on to help implement this project. Webcollect data management platform has been configured to enable interested members to support this project. This project is led by Tariq Salih under the guidance of Dr Mahesh de Silva. This newly introduced project aims to act as a conduit to transfer knowledge from APSL members directly to Sri Lankan University students, in particular with an emphasis on enhancing their employability skills. In this regard, Dr Dulini Fernando conducted the first invited guest lecture at the University of Sri Jayawardenapura, Sri Lanka. An event to cater the Sri Lankan students currently in the UK is being planned for the start of next academic year. As part of APSL’s expanded knowledge transfer activities, a project to review and enhance English language curricula delivered in Sri Lanka has been initiated in collaboration with Foundation of Goodness, a charitable organisation in Sri Lanka. Miss Paola Bethmage is leading this project, and is expected to make further progress in the coming year. The Treasurer Miss Buddhini Liyanage presented the Annual Statement of Accounts for the year 2017-2018, which was adopted as correct. The election of the new executive committee for the year 2018-2019 followed next, and Dr Andrew Nayagam presided as the returning officer. In the absence of any other nominations, the proposed list of nominees notified to the members were elected unanimously as the executive committee 2018-2019. Mr Suraj Wijendra, who was re-elected as the president for his second term, addressed the gathering and thanked Mr Sugeeshwara Gunaratne, acting Sri Lankan High Commissioner for UK, staff members of Sri Lanka High Commission, all the APSL members and well-wishers, for the support given to the association. He also thanked the members for placing the confidence in him. He outlined his drafted programme for APSL and requested everyone to continue to support APSL. Before ending the second session, an opportunity was given to the members to express their views and suggestions on matters related to APSL activities. It was a very fruitful discussion with many members coming up with very useful suggestions for the betterment of the Association in future. The third and the final session of the day was the keynote address delivered by Prof Sir Sabaratnam Arulkumaran, Professor Emeritus of Obstetrics and Gynecology, St George’s, University of London on the title “Reproductive Health and Rights of Women”. Following this highly informative presentation, a Q & A session was held, where several in the audience participated in a highly fruitful discussion. The AGM concluded with the vote of thanks given by the newly elected General Secretary Dr. Leshan Uggalla. He thanked Mr. V. Vincendrarajan, third Secretary (Political, Commonwealth and Media), Sri Lankan High Commission, for attending the occasion. He also thanked Prof Sir Sabaratnam Arulkumaran, APSL executive committee, APSL members and all those who attended the AGM to make it a great success. It was a very successful 14th Annual General Meeting and we look forward to your support and participation in the coming year.